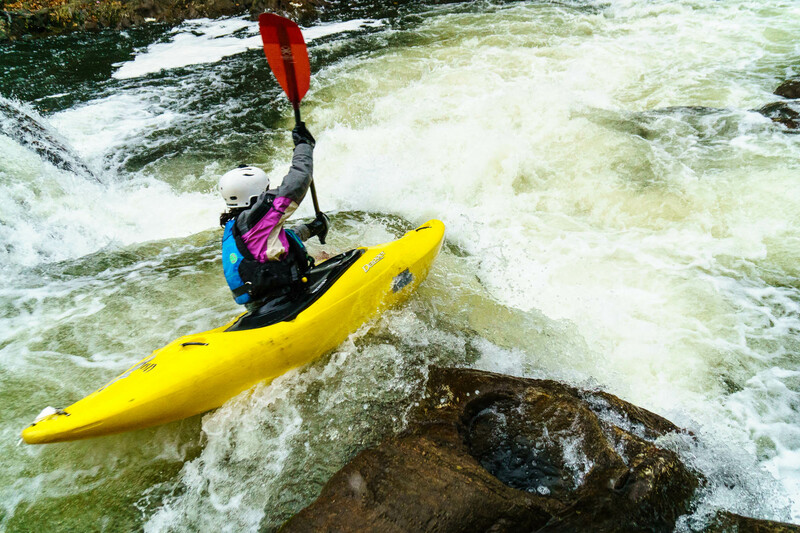 Whitewater kayaking has a pretty high barrier to entry to begin with and self-support kayaking — spending multiple days living out of your kayak traveling down river — is even more intimidating. Kayak camping can lead you to some of the most remote places in the world, through canyons inaccessible to anyone who doesn’t paddle — but you can also do it in your backyard! We’d like to share a few tips and tricks to help every paddler get into multi-day river trips. While there are many well-known multi-day whitewater trips (as detailed on other parts of this site), the possibilities are nearly endless. There are a few key factors involved in finding multi-day trips. This is the most critical ingredient. You can turn any river trip into a multi-day, no matter how short, as long as you have a place to camp. Unfortunately, in more populated areas, this can be challenging. You may be able to find developed campgrounds, but in general, you should be looking for unoccupied Forest Service or BLM land. Public land is great for kayak camping; private land tends not to be. If you’re in a particularly densely developed area, you can always try to ask permission from a landowner, or camp on an island in the river (if available). Try looking for sections of river with hiking trails nearby — in the northeast, the Appalachian Trail parallels a number of excellent sections of river and has designated shelters and camping. Some rivers are better than others for overnighting. A roadside mile-long class IV run? Great for kayaking, not great for camping. But you don’t need a 20+ mile expedition run to make an enjoyable self-support. If it’s got camping spots, even a couple mile after-work run can make for a good local mini-adventure. Put in late, spend the evening camping on the river, paddle out in the morning. Key things to avoid: hike-in runs and portages. The Housatonic River in CT has a number of classic whitewater sections. You can link them up by paddling from Great Falls through Bull’s Bridge and add on a long section of scenic class I-III with great developed and undeveloped camping. Make a list of your local rivers with straightforward access. Look upstream and downstream of your normal put-in and takeout on Google Earth. Is there flat-water? Class II? More whitewater? Maybe the sections are described on American Whitewater. Whatever is there, it could be a nice add-on to the standard run and a way to try a self-support trip without traveling too far. Multi-day kayak trips are as much about the camping and lifestyling as they are about the whitewater, so don’t get too hung up on finding something gnarly for your first try. Kayak camping is similar to backpacking, but generally a bit more luxurious. If you’re an experienced backpacker, by all means, stick to what you’re used to, but throw in a couple beers since you don’t have to carry them! For everyone else, there are a lot of different schools of thought when it comes to cooking on kayak trips. If you’re in an area where you can (reliably) make a campfire, you can just bring a pot and cook on the fire — this is a common and lightweight solution for summer trips in the western US where fires are easy. That’s not always an option, and even if it is, a good stove is nice to have as a backup. We use a Jetboil cooking system and find that style works really well for kayak camping, but plenty of people use MSR WhisperLites or something similar. The WhisperLite can run on many different fuel types and the fuel bottle is refillable, which can be really useful for international travel. This is a bit of a personal decision. I usually use a few drops of bleach per liter; other people prefer an iodine tablet, a SteriPEN , or a water filter. Do a little research and decide what you’re comfortable with. Gravity filters are great for a group — fill the bag and hang it from a tree near camp. It’s important with any of these to consider whether or not your water source (usually the river) is silty or muddy. If it is, you’ll want to settle the water using a collapsible bucket before treating it. Just fill the bucket when you get to camp and leave it settling somewhere out of the way. On a short trip, you may be able to carry enough water that you don’t need to worry about it. Will it rain? How cold is it? Are there bugs? These are all important questions to ask when planning to camp. The most classic shelter solution is a tent: with the fly on, you’ll be warm, dry, and bug free. But tents are often not necessary and if you’re trying to save weight or space, they can be a bit overkill. If the bugs aren’t bad, you can leave the actual tent home and bring the fly, footprint, and poles to save weight and space if you’re only worried about rain or dew. A lightweight tarp does well too. We won’t get into the science of tarpology in this article…but if there aren’t trees to tie your tarp to, you can generally rig something up using a paddle and your boats. If you know there will be trees or other anchors, hammocks are a good option. We’ve used the Hennessy Hammock as an individual sleep system on many self-supports and while it’s a little pricy, it incorporates a bug zip and rain fly and packs quite small. If it’s cold, make sure you bring a sleeping pad to use inside your hammock. 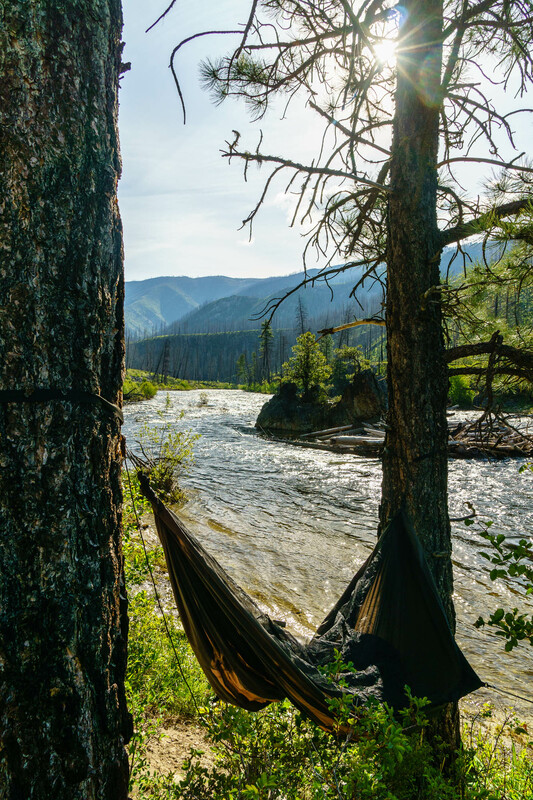 Hard to beat hammocks on the side of the river in the summer. For one night, you can self-support out of just about any boat — even a playboat — especially if conditions are on the warmer side. That said, unless you really want the playboat for the epic surfwave at camp, you’re usually better off with a creekboat (or larger). Loaded boats paddle differently than empty ones. In creekboats, this just takes some getting used to — it’s not necessarily worse, they just feel different. Loaded playboats definitely feel worse. If you’re looking to self-support more regularly, a creekboat will do the trick, but there are advantages to some of the “crossover” boats being manufactured these days. Head on over to our article about Boat Choice — it’s specific to the Grand Canyon, but has a lot of valuable info about the options that are specifically built for self-support kayaking. If you’re thinking about going this route, boats like the Jackson Traverse or Dagger Katana are good starting points (among others). 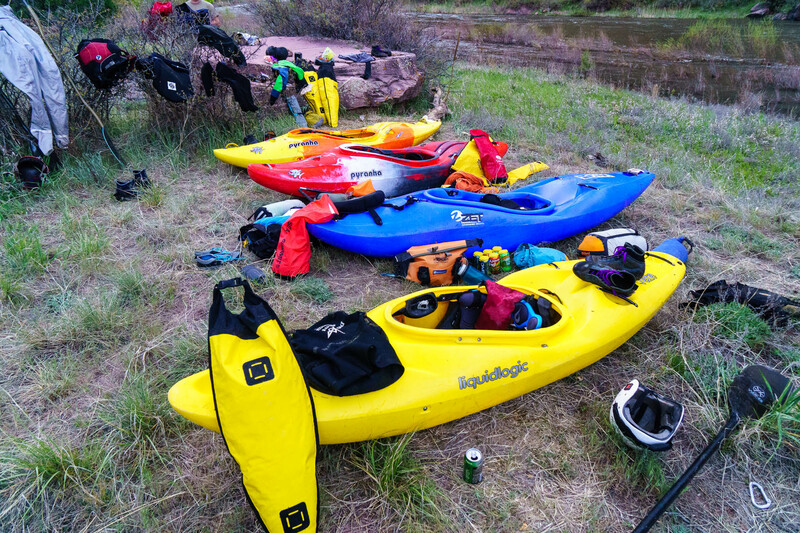 Boats, drybags, and beer — critical ingredients for a kayak self-support. There are a few companies out there that make drybags specifically designed to go in the back of kayaks. They’re called stow-floats and can be really useful, but they’re pricey and there’s no reason to invest in such expensive gear when you’re first getting into self-support. To some degree, you get what you pay for with drybags, but they’re all dry when you first buy them as long as you close them properly. The cost differences generally come down to weight and durability, not dryness. If you’re trying out self-support kayaking for the first time, there’s nothing wrong with the cheap drybags from Walmart. Sea to Summit drybags are a small step up in price and a big step up in quality — lightweight and very flexible material. We use these most of the time. Personally, we only spring for the expensive Watershed dry duffels for camera gear. In many areas, you may not be required to pack out human waste, but it’s always courteous and if you’re in a heavy use area, please consider using a groover to carry it out. Got other questions? Let us know! Leave no trace and have fun out there! I’m curious about settling silty water (specifically on the Colorado River near Moab). Is an over-night settle sufficient to filter? I’ve also read about folks using an additive to speed up the settling process. Any experience with that? We’ve never used an additive. Overnight settling is generally more than enough. It depends a bit on your tolerance for silt in your water, but it often becomes fairly clear within an hour or so, even on murky rivers like the Colorado.